The Hotel Restaurant Pizzeria Cavallo Bianco is in an ideal location for cultural, sports and dining days out. The town of Dronero holds interesting evidence of its rich history, starting with its medieval origins up to the beginning of the Twentieth century, when the then Prime Minister Giovanni Giolitti used to visit as soon as he managed to break away from his government obligations in Rome. In this area you can find ethnographic museums, natural sites and cities of art: you’ll be spoiled for choice! 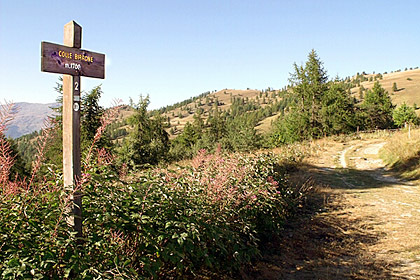 As it is at the centre of the beautiful and still uncontaminated Maira Valley, Dronero can be a fantastic starting point for different kind of trips in the immediate vicinity, or can be used as a midway stop-over for longer trips. – many other sports: swimming, climbing, paragliding, tennis, football, basketball, volleyball, beach volleyball, a local version of hand ball (pallapugno), mini golf, bowling and fishing. For many years now, local associations have organised culture, sports and entertainment events in the area. We look forward to personally providing more information on activities and events. 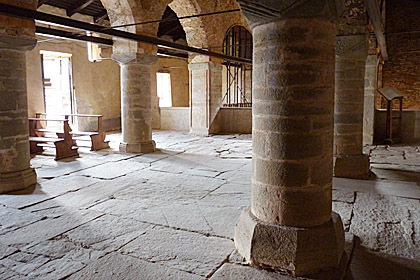 – Colonnade in the church of the Romanesque-Gothic complex of San Costanzo al Monte (Villar San Costanzo) near Dronero. – Colle Birrone (1700 m), on the watershed between the Maira and Varaita Valleys. It is located along the “strada dei cannoni” (road of cannons). – View of Dronero from the new bridge. At the centre you can see the impressive Cinema Teatro, recently restored and fully operative.